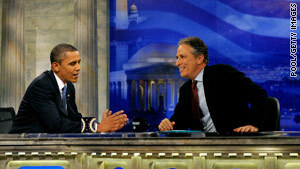 President Obama and Jon Stewart chat during a break in the taping of Wednesday's "The Daily Show" in Washington. Washington (CNN) -- With just days to go before the midterm elections, President Obama joined comedian Jon Stewart for a taping of "The Daily Show" in Washington. Wednesday's show marked the first time a sitting president accepted an invitation to appear on the program. The taping at Washington's Harman Center for the Arts took place before a packed house, with all 550 seats filled after hundreds waited in line outside for up to four hours. The Comedy Central network show is taping all week in Washington prior to Stewart's planned "Rally to Restore Sanity" on the National Mall Saturday. One of the first questions Stewart asked, referring to Obama's presidential campaign two years ago, was, "Are we the people we were waiting for, or does it turn out those people are still out there -- and we don't have their number?" The rhetoric Obama campaigned on two years ago when running for president was an area Stewart and Obama returned to often during the nearly 30-minute taping. "You ran on the idea that this system needed basic reform... feels like some reform was done in a political manner that has papered over a system that is corrupt," said Stewart. Obama replied saying, "Over the last two years in emergency situations our basic attitude was we have to get things done, in some cases quicker. They worked within the process instead of transforming the process." At one point, the president also referred to his campaign theme of change, saying, "When we promised change you can believe in, it wasn't in 18 months. It was change we were going to have to work on." The audience responded with applause. At one point, Stewart confronted the president about his fellow Democrats' currently facing tough re-elections saying, "Democrats are now running on, 'Please, baby, one more chance." Obama responded by saying, "Folks are going to be frustrated," and continued by listing his recent accomplishments as stabilizing the economy and restoring financial regulatory reform. "When you look at what we've done... over and over again we have moved forward an agenda," Obama said. The president made a point of defending his push for health care reform and efforts to stimulate the economy, saying it is his hope that fellow Democrats will be rewarded in the coming election for standing up for their beliefs. Later, "The Daily Show" host was rebutted by the president after Stewart commented that after Obama ran with "audacity," legislation "has felt timid at times." "Jon, I love your show, but this is something where I have a profound disagreement with you," Obama said, "This notion that health care was timid." At the end of the interview, Obama returned to his famous campaign phrase saying, "Yes we can," and Stewart laughed. Obama continued, adding, "But it's not going to happen overnight." The president also joked with Stewart about the upcoming "Rally to Restore Sanity," saying, "The one thing that might have made a difference is if you held a 'Rally to Restore Sanity' two years ago... and can I just make a plug," the president said before leaving, "...To go out and vote." The show was scheduled to air Wednesday night at 11 p.m. ET on Comedy Central.